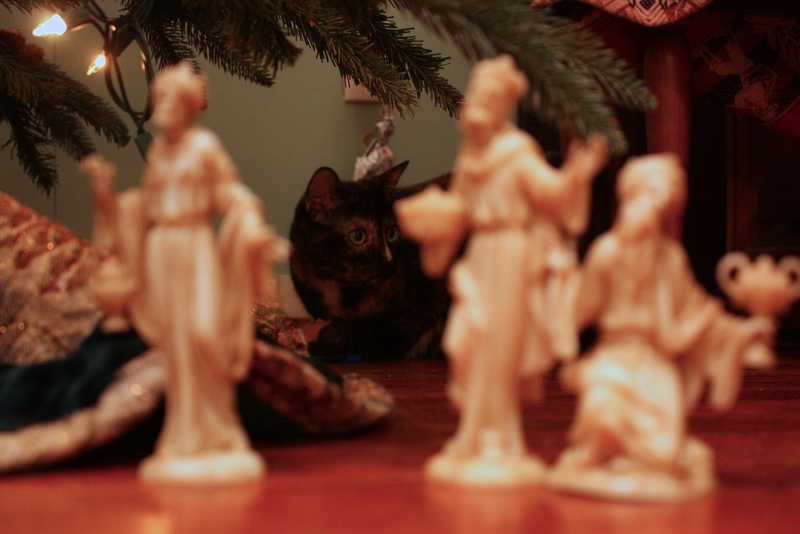 Speaking of wise men, is this a universal truth, or just a coincidence in my home and the one I was brought up in that every Christmas, the last wise man in the nativity "gets it" from the household pets, eventually biting the dust somewhere near the edge of the tree skirt? Growing up it was the only black wise man in my mother's ceramic set that our cat would walk past and swipe at. This left my brother and I, growing up in the deep south, to speculate on our cat's hidden prejudices, though she was black herself. But, you know, he was trailing behind the rest of the party at the manger scene, just outpaced by the shepherds in worshipping the Christ child on Christmas morn, and so had to be doomed. (I won't bother with biblical accuracy when it comes to the nativity.) My mother tried to save him year after year, and with each gluing, he acquired more chipped spots and poorly reattached limbs. 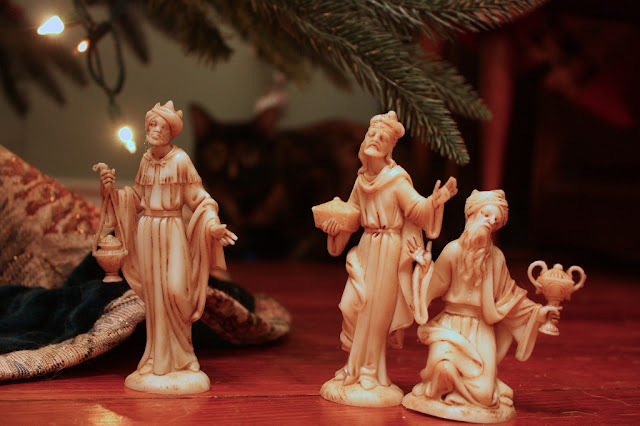 As an adult, my cats have always enjoyed tormenting our last wise man under the tree too, only I thought I'd prevented Christmas carnage by using a plastic nativity I inherited. 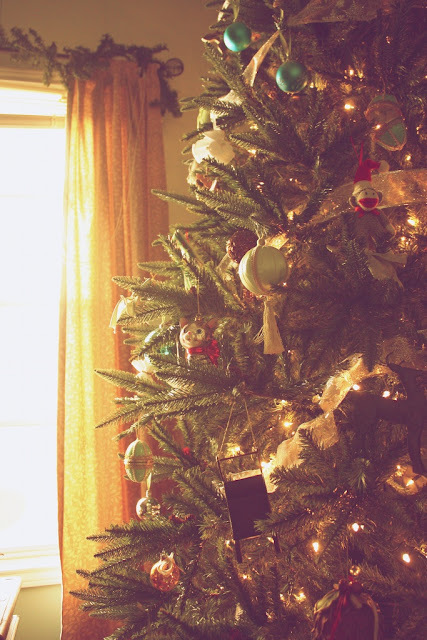 (Really, it's not as tacky as it sounds, it looks kind of like carved wood under the artificial tree.) Anyway, it has weathered 2 children, 2 dogs, and 2 cats over the years... until this year when the ax fell. There he is, below, poor guy. This time, my little dog was the culprit. It seems two to three miles is still not enough of a walk for my littlest dog to wear off his crazies. We were only gone for a second on a last minute Walgreens run. 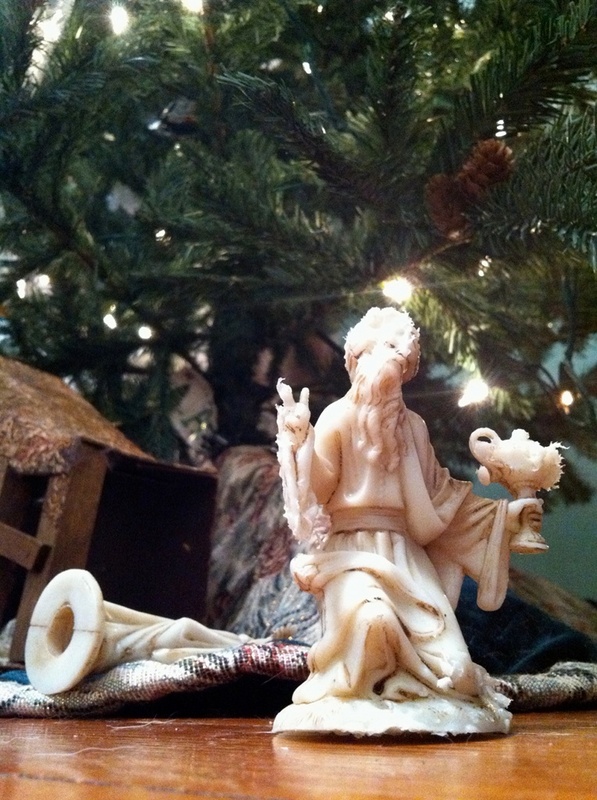 If you look close, now, you can see the chewed up edges of his frankincense censor... and his hand... and head. Oh well, it is a Christmas tradition, I guess, and the important thing is he's still in there, expecting the miracle.